Threshold issue #18 is out! Issue #18 of the Threshold Magazine is available now! A new land for the people who came from the east - the Espans, the Traldars and the traders braving the western seas..
An ancient land for the people who have called it home for centuries or millennia. This is the Savage Coast, a land of freedom, opportunity and diversity. A land under the grip of the Red Curse, where the precious cynnabryl can be mined and turned into the deadly weapons of red steel, used to cure afflictions and inherit great powers. A land vast and mysterious, where the Lawful Brotherhood keeps watch to stop the spreading of chaos. The Savage Coast is still very much an unexplored land which needs workers, cartographers, colonists and heroes to defend the frail bastions of hope against the unknown. 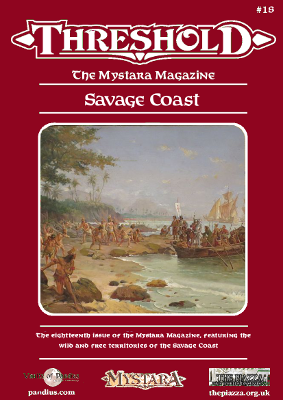 - People of the Savage Coast, by me, developing the intelligent races described in the Savage Coast Monstrous Compendium, and making them playable races. - Dwarven Families Expanded - Part 1, by Hausman Santos & Leandro Abrahão, a detailed description of Rockhome families, providing a lot of dwarven NPCs (or PCs), continuying from Updated to your Rockhome campain in issue #16 and to be continued in issue #19. - Engdyr’s Game II - Ruins of Layhash, by John Calvin (Chimpman) an adventure path set in the Known World of 2300 BC, continuying from issue #16 and #17 and to be continued in issue #19. Last edited by Sturm on Wed Jan 31, 2018 12:42 pm, edited 1 time in total. Re: Threshold issue #18 is out! Just downloaded 18. Looks pretty cool. I also downloaded 13 and as I was going through it, a thought occurred to me. Has anyone considered doing an issue that was all monster manual? Or more appropriately for Mystara, all Creature Catalog? I'm talking about an issue that was 100% new monsters all statted out for BECMI, although I suppose a lot of people here would want 5e stats, correct? What do you think? Would there be any interest in that? Obviously, you'd need contributors. ghendar wrote: Just downloaded 18. Looks pretty cool. I also downloaded 13 and as I was going through it, a thought occurred to me. Has anyone considered doing an issue that was all monster manual? Or more appropriately for Mystara, all Creature Catalog? I'm talking about an issue that was 100% new monsters all statted out for BECMI, although I suppose a lot of people here would want 5e stats, correct? That is a a great idea. Personally, I'd just keep them as BECMI stats (even though my group uses 3.5E/Pathfinder) for simplicity's sake. AC995-Traianus Decius Aureus- Praetorian Legate, Equites Laurifer, bearer of the Corona Civica, Corona Muralis and Corona Obsidionalis -delivered the motherland from the Thyatian occupation and was raised to the purple by the Praetorian Guard. We could start a new thread and see how many folks would be interested in contributing. Chimpman wrote: We could start a new thread and see how many folks would be interested in contributing. Great idea. Count me in. Although, other than contributors, another stumbling block might be illustrators. Yeah!!!!!! Time to sit down for a long winter's read! Thanks to all who made this issue possible! Thanks for putting my work there love u guys!!!!! !